The Quadra is one of those interesting pieces of kit. When it was first introduced I considered it to be a contender for use on 'one man' quick shoots and I was convinced that the full sized more powerful Elinchrom Rangers would continue to be my mainstay. As time has passed though, I have found myself using the Rangers less and less, and the Quadra's more and more. The compact, lower weight and sheer convenience has carried the day on many occasions. Well there is an interesting upgrade available on the near horizon. 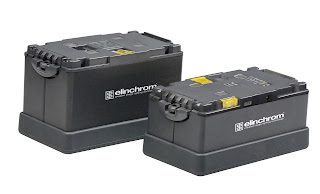 Elinchrom has developed a Lithium Ion battery option for the Quadra, which is smaller, lighter and is rapid to charge too. In addition, the Li-ion battery will recharge in 30mins to more than the maximum capacity of the Lead Gel battery! The good news is that it is you can 'convert' your existing Quadra to accept the LI battery. I will be buying at least 2 of these batteries and will let you know how I get on. The only fly in the ointment is that some airlines are cautious about letting you fly with Lithium batteries. Though these batteries are Swiss built to the highest standards, with documentation which shows they are safe complying to International standards, therefore safe to fly with. VERY interesting possibility, I have a Pelican case with my two Quadra kits, and the three batteries I have in there DEFINITELY add the weight. The added pops for less weight are definitely a bonus. I wonder if they also help improve the recycle time (which can be painfully slow on those full pops sometimes). That sounds pretty exciting although fairly pricey. I got four of the lead batteries as part of my to head kit just before Christmas but they don't half way a ton!